Consolidated stipend of Rs. 14587/- per month Trainee (Agriculture)-12 Posts,Trainee (Laboratory)-02 Posts.One year training. Consolidated stipend of Rs. 14587/- per month,Pay Scale-One year training. Consolidated stipend of Rs. 14587/- per month. Last date of application-The last date of receipt of application is 07.09.2015.The post is available at Head Office, New Delhi and Regional Office situated all over India. Age relaxation for SC/ST, OBC & PH will be applicable. Fee-Fee can be deposited by DD/ Banker’s Cheque of Rs. 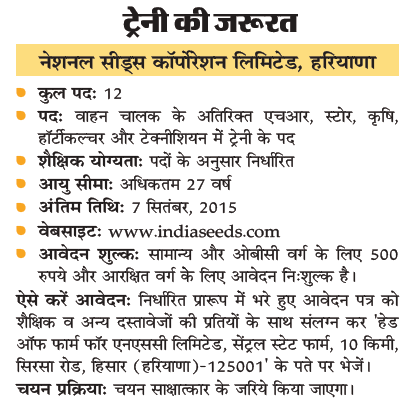 500/- (Non-Refundable) in favour of National Seeds Corporation Limited , payable at New Delhi.